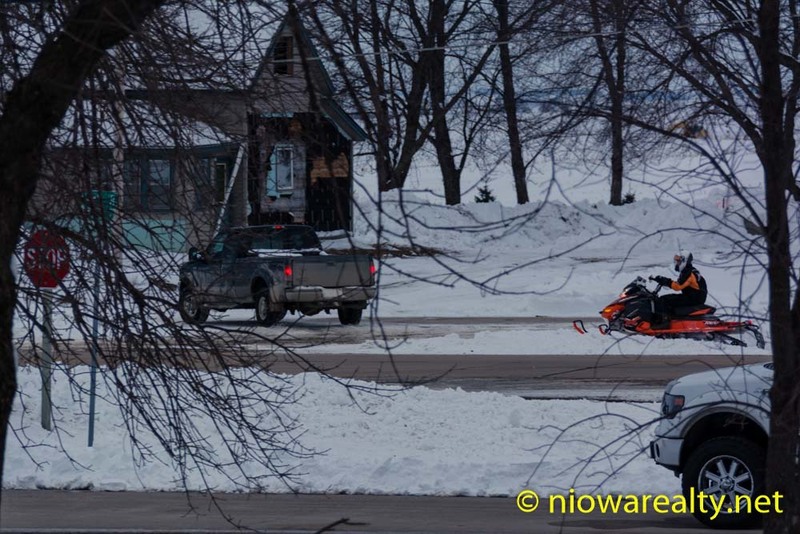 Share the post "Snowmobile Mania"
This was certainly a day to remember after having discovered I had far more work ahead of me than I’d expected. It was actually to the degree I had to later make a phone call to one of my ex-tenants who’s usually willing to help me if and when he’s available. My initial text to him said, “Have you got time to help me today?” He later replied, “What time do you need me?” My most urgent reply was, “ASAP”. When he arrived he said laughingly, “I figured it must’ve been something urgent because you’ve never said ASAP before.” As the old saying goes, “Many hands make little work.” and those words certainly befit today’s project. I’m just glad we managed to get everything done. I was hoping for the temps to be above freezing today, but we just didn’t quite get there. There are too many mounds of snow around our City which are not to my liking. If any of you were out driving in the country yesterday, you’d agree the roads were very much on the dangerous side with the wind blowing snow across the highway and creating slick spots. As I was driving back from Garner on Hwy 122 late yesterday afternoon, I noticed flashing red lights in the distance. As I grew closer, I could see there must’ve been an accident. There were ambulances and police cars at the scene of what looked like a three or four car pile-up. The Highway Patrol was waving us to turn off on a gravel road before I could get a good look at the scene. From the other direction I noticed at least a mile long stretch of vehicles waiting for the highway to be cleared. Since I was so busy today, I didn’t have a chance to check the news to see if any of those involved were seriously injured. Not but ten minutes before I saw those red lights, I thought how inconsiderate some highway drivers were by not driving more slowly over those patches of ice and snow. What I think must’ve happened, was possibly the first car was braking to turn and lost control at that country intersection. The other cars perhaps tried to miss the first car and found themselves loosing control as well. Believe me, I’ve seen some nasty pile-ups over the years on Interstate 35 between here and Des Moines. Moving vehicles don’t always take kindly to strong winds and blowing snow—especially when there are hills creating straight-line wind tunnels. There was yet another sight on my drive back to Mason City which caused me to shake my head in disbelief. There were ten or twelve snowmobilers driving the ditches parallel to the highway. One of them even had a youngster hanging on his or her back. “In this near darkness, along with the cold and blowing wind?” I said to myself as I watched them bouncing up and over the approaches to grain fields. Since I’ve never ridden a snowmobile in my life and likely never will, one would think they’d find better days, along with times of the day to be riding those widow makers. What irritates me the utmost, are the cavalier attitudes some of them have by flying across non-public lands—especially at night. There’ve been many gruesome stories told about snowmobilers being seriously and sometimes fatally injured while out speeding thru groves and fields being privately owned. Half hidden barbed wire fences and bent steel posts can do some real damage to those machines and their riders far faster than one can bat an eye. All the warnings in the world seem to fall on deaf ears belonging to those who’re filled with snowmobile mania.